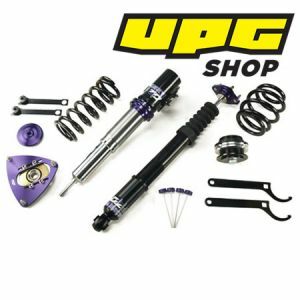 This coilover kit is specially made for rally asphalt. In addition to stabilized the vehicle, it absorb the bumps caused by the uneven roads. Standard design for wishbone coilover. There are φ44mm pistons in the strut which can contain large amount volume shock oil for handling everlastingly and prevent the shocks from its exhaustion after long-term use. The ride height adjustable bottom mount is necessary to adjust the ride height desired and no need to compress the spring. 36 different dampening settings to match different kinds of road conditions. All McPherson coilovers come with pillowball upper mount with camber plate. It adjusts the camber of the tires and get the tires have better turn and enhance the stability of the vehicles. The spring rate and dampening settings are specially for rally asphalt. It cannot use for rally gravel and rally snow. The ride height can be dropped 60mm~120mm from OE ride height. 3D pillowball upper mount for your options, camber and caster can be adjusted.